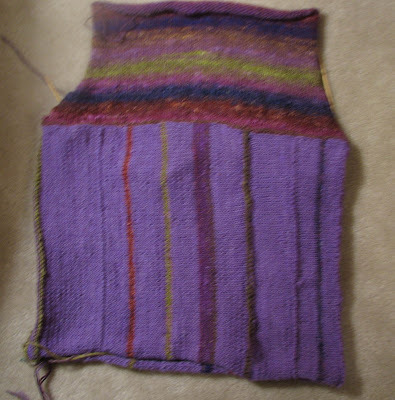 In keeping with my 2007 Knitalutions, I finished the Sloane vest for myself, as well as the Broad ripple Socks I started I don’t know how long ago. That’s two WIPs done! Using circulars! Made a vest! Yay! In keeping with another knitalution, I’ve been plugging along on Poppy, with the help of the KAL. It is so helpful to have other examples of the finished item other than just the one in the pattern book, and to hear what others are finding as they attempt the pattern. I finished the bottom panel done in Noro Cash Iroha (love that yarn) in Periwinkle (with random Silk Garden stripes) and completed the top part of the back of the sweater. Now for the front and then the sleeves. The Silk Garden is fun to knit with to see how it will stripe next. In further keeping with the knitalutions, I started Jaywalker socks, but the gauge is way to big. I will have to keep another knitalution (to frog when necessary). I plan to either start them over, or make Monkey socks from Knitty. I saw some on another person’s blog, and they looked so pretty! I also made my first mixed CD on my laptop’s CD burner for my Favorite Color Swap partner. Today, dh had to work, so dd and I made heart cookies and Valentines. Poppy looks fabulous! I have heard so many great things about Noro Silk Garden one day I am really going to have to try it. Your package should be shipped out this Tuesday – thank you so much for your patience and understanding! I was waiting for something to be sent to me and it seemed to take quite a bit longer than usual. Can’t wait to see your Jaywalkers – I have yet to make those myself. Hmmmmm maybe that is what I will make with my new hand dyed yarn. That is too funny about marriage. It is such a confusing thing for little people – there is a stage generally where they declare they will marry one of their parents too. Innocent things! Sounds like fun baking together. Thanks for the complement. I wasn’t sure how it would “translate” in the photo.